Animals that hide on the seafloor are often masters of disguise. But even the most evasive of prey cannot hide from hungry stingrays. These predators can detect tiny electric currents radiating from animals like shrimp and small fish. Without using their ears, nose, or eyes stingrays can locate and devour their prey. Exactly how this “electric sense” works is what fascinates Stephen Kajiura, an associate professor of biology at Florida Atlantic University. In his shark lab, Kajiura measures the low electric currents that animals generate, and replicates those currents to understand how stingrays find their prey. 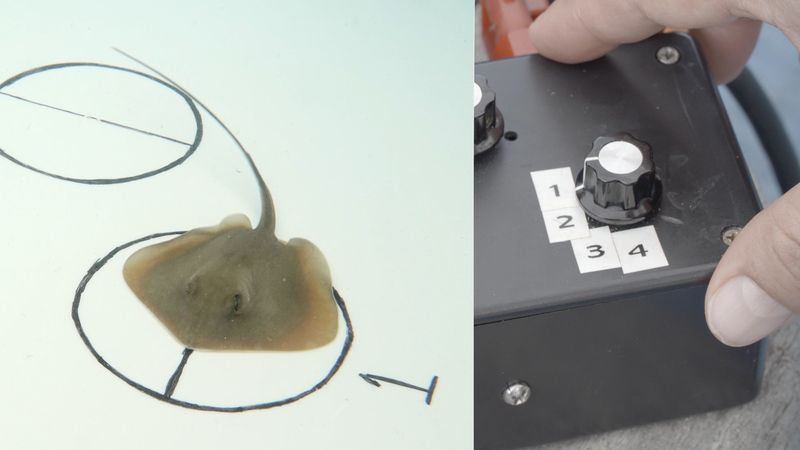 By luring a stingray toward electric pulses in a tank, Kajiura can measure the sensitivity and range of the stingray’s ability to detect them. "All organisms are electric,” Kajiura says. “They have this electric field, this aura around their body, whether you are a shrimp or a fish or a crab or whatever." For example, a fish breathes in and out about twice every second, generating a current of around 2 hertz. Most animals don’t have the ability to detect electric fields. But sharks, rays, skates and sawfish — members of a group called Elasmobranchii — are masters of detecting electric signals. It’s one of their defining features. Elasmobranchs have specialized organs called Ampullae of Lorenzini. These tiny structures allow them to home in on weak bioelectric fields generated by nearby prey. 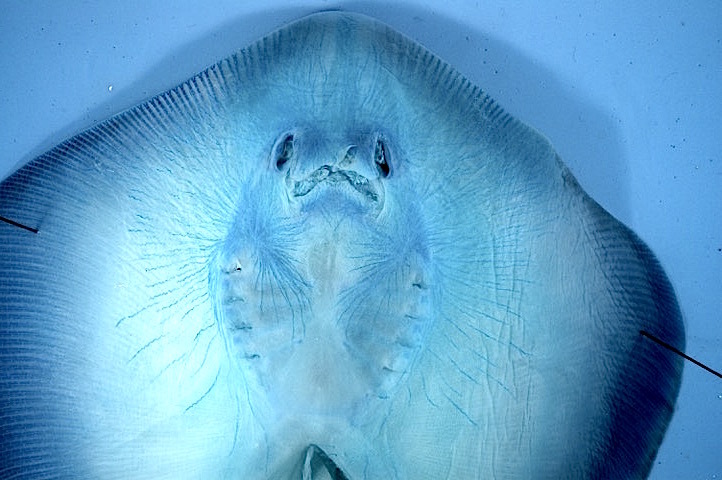 Elasmobranch’s electrosensory organs are named after a 17th century Italian physician, Stefano Lorenzini, who first identified them while dissecting an electric ray. Lorenzini noticed dozens of tiny pores around the animal's mouth. 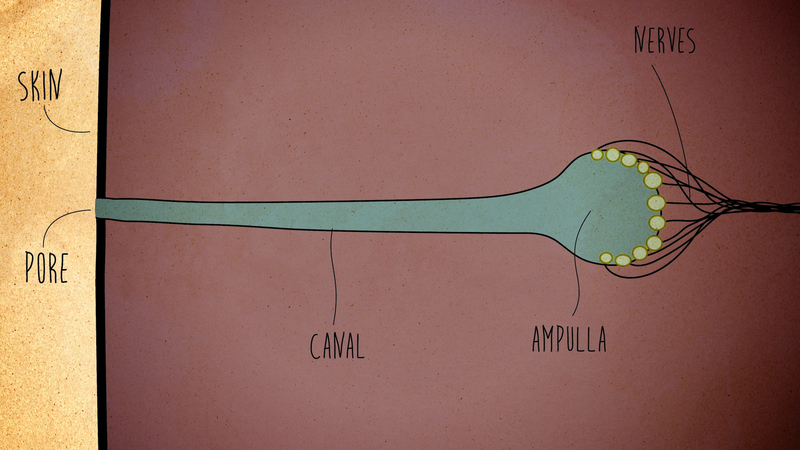 Each of the pores led to jelly-filled canals that ended in pocket-like structures that he called ampullae, the Latin word for a type of round-bottomed flask. "We have discovered that sharks have electric sense only in 1966. That’s not even 50 years ago,” Kajiura says. “That’s a whole new sense that’s been discovered. It would be like us discovering vision for the first time only 50 years ago." What Are Weak Bioelectric Fields? Animals emit low frequency electric fields due to a process known as osmoregulation. This process allows the concentration of ions (charged atoms or molecules) to flow between the inside of our bodies and the outside. In order for our cells to stay intact, the flow of ions needs to be balanced. But balanced doesn't necessarily mean equal. The concentration of ions within a shrimp’s body is much lower than that of the sea water it swims in. Their voltage, or potential difference generated between the two concentrations across "leaky" surfaces, can then be measured. "Across the shell of the shrimp, it’s not very leaky, it’s a nice watertight seal," Kajiura explains. "But at places like the mouth, or the gills, where you’ve got this soft tissue, there is very little between… the inside the body and the seawater. You have the potential to have leaky ions going across." In the long term, Kajiura says it may be possible to take advantage of electric sense to develop repellents. This could potentially keep sharks away from popular surfing spots and commercial fishing lines. That would be good for sharks because they are often caught as bycatch and killed by long-line fisherman seeking tuna and swordfish. In the meantime, Kajiura says, the overall topic of electroreception is wide open for discovery. “It’s a whole new sense. A whole new way of collecting information about the environment,” he says. “And there is so little work that’s done on this entire sensory system, that I think there is so much cool stuff we can do. Things we don’t even know about yet. Things we haven’t even imagined yet, I think are wide open."